Buy A Home With Low Money Down: Is It Possible? If you are getting into the market to purchase a home, you may be wondering if it is possible to Buy A Home With Low Money Down and the answer might very well surprise you. The answer is a clear YES, you can Buy A Home With Low Money Down and there are plenty of options for you to choose in order to make your dreams come true. The common misconception is that you can only get FHA loans with minimal money down, but this is far from the truth. There are plenty of other mortgage programs out there that will allow you to purchase a home with 5% down or even less! Yes, an FHA Loan might be an option for you, and a popular option I might add, but in this article we will go over your list of options and the requirements needed to obtain such loans. The most popular loan program in the country is the FHA Loan and for good reasons I might add. With a credit score as low as 580 FICO, you are able to obtain an FHA Loan with as little as 3.5% down. There are very few programs out there where you can get a loan with a 580 FICO, let alone with 3.5% down. Yes you will have a MIP (mortgage insurance premium) due for the life of the loan or until you refinance out of it, but this program allows home ownership for even the most credit challenged individuals which it is #1 on the list of how to Buy A Home With Low Money Down. The other option you can go with Fannie Mae and Freddie Mac if you are not a first-time home buyer is to go with their standard 95% LTV or 5% down loan. Yes, you are going to be paying PMI on your loan until you are under 80% LTV, but the argument is you were now about to Buy A Home With Low Money Down. If home ownership is the goal, you will have obtained that goal. If there is one way that veterans get something positive for themselves, it is in the form of a VA Loan. For veterans and active military members, they are able to purchase homes with no money down. These loans are fully insured by the federal government and only require an upfront funding fee which can also be rolled into the loan as well. There isn’t a minimum credit score, and the requirements may vary from lender to lender if they have a lender overlay. If you live in a government declared rural area and are in a low income bracket, you are eligible for a USDA loan that can be had with no money down as well. There are lending guidelines needed for these loans, however they is no minimums for credit score and maximum debt to income ratio. There are no loan limits for USDA loans, however, given the income restriction to obtain these loans, you will be restricted on what you can purchase. 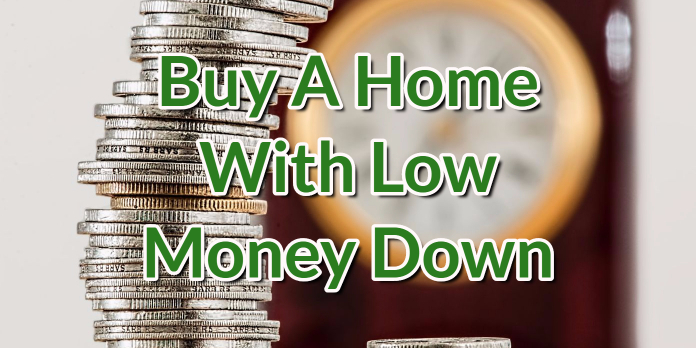 As you can see there are many ways you can Buy A Home With Low Money Down, you just have to do your research and see which program is best for you. If you aren’t quite sure which route you should go, you need to reach out to me ASAP and get your loan today! I can be reached any time at 888-900-1020, via email at contact@loanconsultants.org, or via my website www.loanconsultants.org.